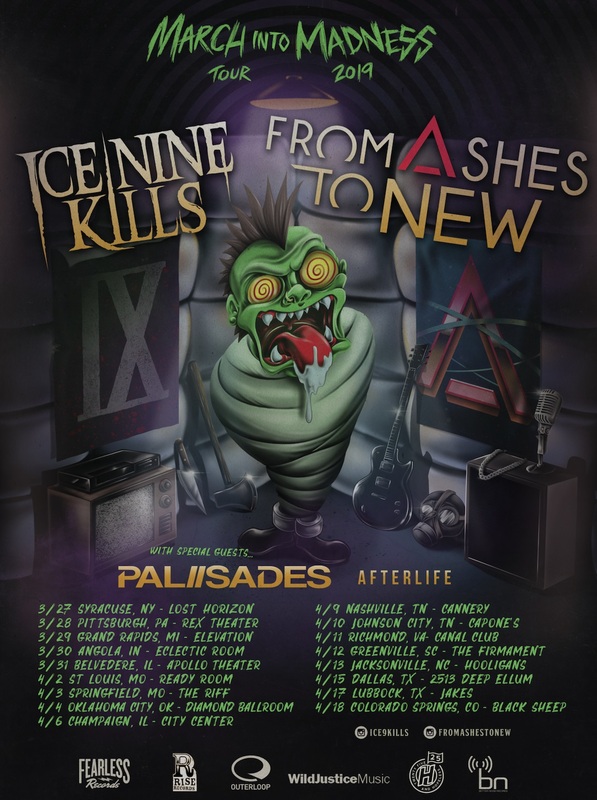 Ice Nine Kills announced a new slate of live dates this week. The band announced on Thursday, that it will launch the “March Into Madness Tour” on March 27 in Syracuse, NY alongside From Ashes To New. The tour is scheduled to run through April 18 in Colorado Springs, CO. Its current schedule is noted below. INK front man Spencer Charnas said in a recent interview, that he was looking forward to the tour. From Ashes To New front man Matt Brandyberry shared Charnas’ anticipation. 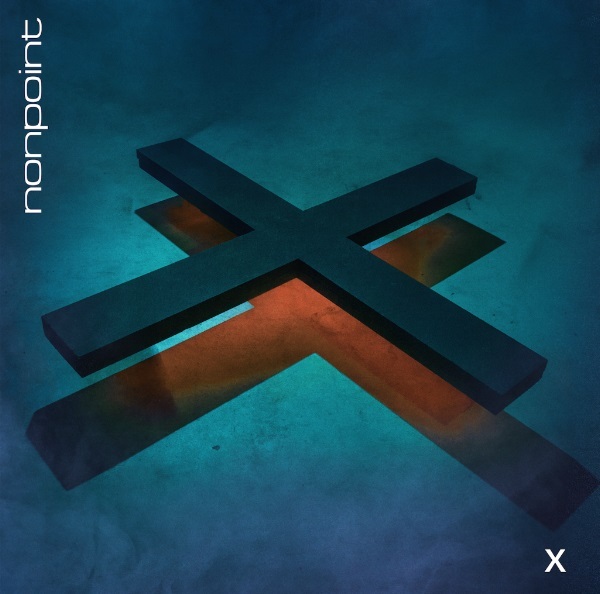 Nonpoint released its latest music video this week. The band debuted the video for its latest single ‘Wheel Against Will‘ on Wednesday. The song is the fourth single to be released from the band’s new album X since the album’s release on Aug. 24 via Spinefarm Records. The band debuted the album’s first two singles, ‘Chaos & Earthquakes‘ and ‘Dodge Your Destiny‘ in June. The album’s third single ‘Fix This‘ debuted only weeks later in July via Loudwire, while the official video for ‘Chaos & Earthquakes’ followed in August. The new ‘Wheel Against Will’ video places the up-tempo opus and its seeming sociopolitical commentary against a visualization of the band at work in the studio. Mixed into the video is footage of front man Elias Soriano up close and personal reciting the song’s lyrics while friends recite the song’s chorus and drummer Robb Rivera practices his part in what looks like a hotel room. Eagle-eyed audiences will note Rivera sporting a Machine Head pullover in some of the scenes as a bonus of sorts. It is not known if these scenes were shot before or after Machine Head announced its breakup over the summer. Nonpoint is currently wrapping its tour with P.O.D., which is touring in support of its own new album, Circles. The remaining live dates on the bands’ tour are noted below. Veteran metalcore band Atreyu is wrapping up the current leg of its North American tour in support of its current album In Our Wake. The band’s tour is currently scheduled to wrap Dec. 13 in Anaheim, California before the band takes some time to rest and recharge for the annual Shiprocked cruise that launches Jan. 26 from Galveston, Texas. While the band’s current tour schedule is winding down, audiences can still hear the band’s new album when they order it or buy it in store. The 10-song record is a record worth hearing, too, whether one is a longtime fan of the Orange County, CA-based band or just a metalcore fan in general. That is proven in part through the album’s opener/title track. ‘The Time Is Now,’ which also comes relatively early in the album’s run, also supports that statement, both musically and lyrically. ‘Safety Pin,’ which comes later in the record’s run, is yet another of the works featured in this album that exhibits the album’s strengths, and is certainly not the last of the songs featured throughout the 45-minute record that makes the album so appealing. Any of the other works included in the album can just as easily be cited in showing the album’s strengths. Between those songs and the works more directly noted here, the album in whole proves to be another positive offering from Atreyu that will appeal just as much to the band’s fans as it will metalcore fans. Atreyu’s latest full-length studio recording In Our Wake is another strong new offering from the veteran metalcore outfit that is certain to appeal just as much to the band’s most devoted fans as it will metalcore fans in general. As the album’s title notes, its songs are works that look back on life in all of its positives and negatives, examining those outcomes. Those ruminations make for a record to which plenty of audiences will be able to relate. The album’s opener/title track is just one of the songs that serves to support those statements. That is proven in part through the song’s musical arrangement, which is a radio-ready metalcore arrangement that instantly lends itself to comparisons with other similar acts, such as Ice Nine Kills, Set It Off and Bullet For My Valentine, just to name a few. The more upbeat, melodic metalcore style here is driven by the time keeping of drummer Brandon Saller, who keeps the song moving forward solidly throughout the three-minute-plus opus. The dual guitar approach of Dan Jacobs and Travis Miguel strengthens the foundation formed by Saller while front man Alex Varkatzas and bassist Porter McKnight put the finishing touch to the work. The arrangement’s brooding sound is a good compliment to the song’s lyrical content, which finds Varkatzas asking outright, “Who will we leave in our wake?” That opening line leads to an even deeper introspective presentation that is certain to generate plenty of discussion among listeners. The lyrical theme at the center of ‘The Time Is Now’ is another statement that centers on someone celebrating life. This is inferred as Varkatzas sings in the song’s lead verse, “Here at the starting line/Never-ending race/What I’ve got inside is commonplace/I’ve been dreaming ‘bout/Hope for better days/Time for dreaming’s done/Time to face the sun.” Right off the bat here, Varkatzas is singing (seemingly) about someone who wants to make the most of life, singing, “Time for dreaming’s done/Time to face the sun.” This inference is strengthened even more as he goes on to sing in the song’s chorus, “Flying high above the world/It’s a new life/It’s a new mind/And I will never fall.” This is a statement of optimism, flat-out. He goes on to sing in the song’s second verse, “I cannot stop/See another way/Am I looking for another cheap escape/I’ve been pushing forward/Crushing everything/It’s a push and pull/It’s a give and take.” From there, he goes on to reprise the chorus, yet again emphasizing that positive outlook on life. It’s a view that continues on through the second half of the song, right to its finale. That positive lyrical theme, coupled with the song’s infectious musical arrangement is certain to put a bright smile on any listener’s face while proving once again its strength, and even more, the strength of In Our Wake. Even with that strength noted, it still is not the last of the album’s most notable additions. ‘Safety Pin’ is yet another important addition to In Our Wake. It shows the other side of the noted ruminations on the impact that we and others have on one another, and does so in quite the fiery fashion. Unlike ‘The Time Is Now’ and ‘In Our Wake,’ ‘Safety Pin’ is a fiery work that addresses the negative impact that another has had on someone else. As with the album’s other works, this song’s arrangement is more of a melodic metalcore style work than standard screamo-style work in regards to its musical arrangement. It is an upbeat work, yet maintains a certain middle ground that helps to illustrate the song’s lyrical content. That content seems to focus on some wrong that has been done to the song’s subject. That alleged wrongdoing has not beaten the song’s subject, though. This is proven as Varkatzas sings, “I can feel you in the back of my skull/On my best days/Worst ways/I don’t wanna talk about it/I can see you waiting for me to fall/Casting black rays, wasting/I don’t wanna talk about it/I won’t let you in/No, I won’t let you in/I will rise to walk again/I won’t keep on listening/The sorrow, I won’t let it in/My life held by a safety pin.” This comes across as the song’s subject saying life is fragile and he/she is not going to let another’s wrongdoing take advantage of that fragility, but rather will push on. This is inferred even more as Varkatzas sings in the song’s second verse, “try to cut me from a walk to a crawl/I will get up, stand up/And now I wanna talk about it/Try to break me/I can still take a shot/I will wake up, stay up/Now I wanna talk about it/Let’s f***ing talk about it.” That defiant declaration leads to a reprise of the song’s chorus, which again strengthens that sense of defiant optimism against life’s negativity. It is another way in which the album addresses the question of who we will leave in our wake and how they will be left, just in a different fashion from the other noted songs. When it is considered along with those other songs – both those noted here and those not directly noted – the whole of the album becomes a record that sends an important message, and hopefully leaves listeners contemplating a lot of things in their own lives. 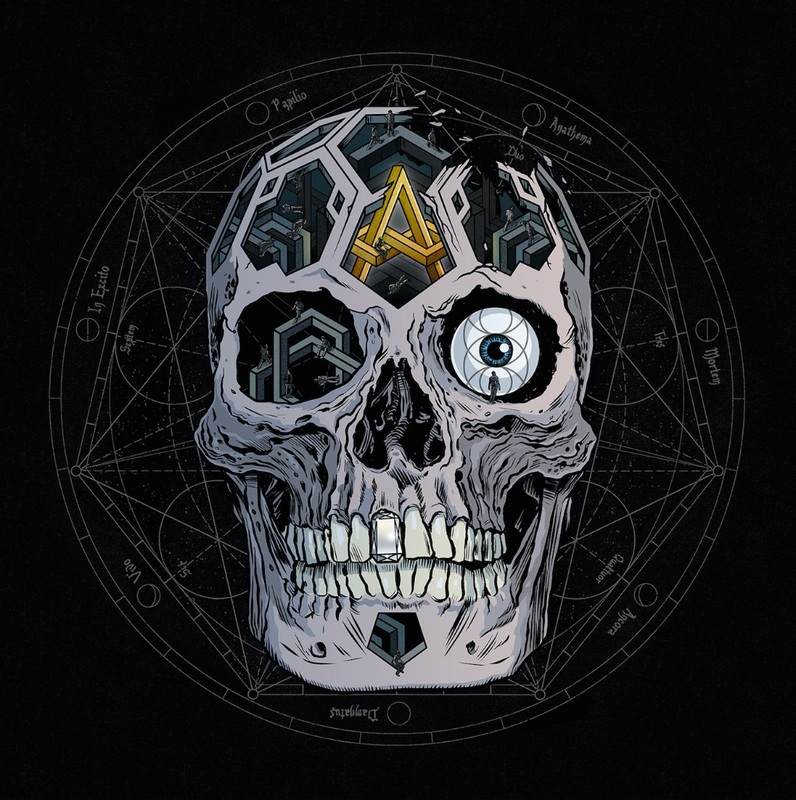 To that end, this record is both musically and lyrically a solid new offering from Atreyu that is certain to appeal just as much to the band’s most devoted fan base as it will to metalcore fans in general. Sleep Signals has hit the road with Atreyu for its “In Our Wake” tour. The band is serving as support for Atreyu for the tour, which launched Friday and is currently scheduled to run through Dec. 13 in Anaheim, California. Also joining the tour as support are Memphis May Fire and Ice Nine Kills. Sleep Signals is touring in support of its most recent release, its six-song EP At The End of the World, which was released independently by the band on Sept. 8, 2017. The band recently premiered the video for the EP’s latest single, ‘Edge of My Sanity.’ The song is streaming now via Spotify. 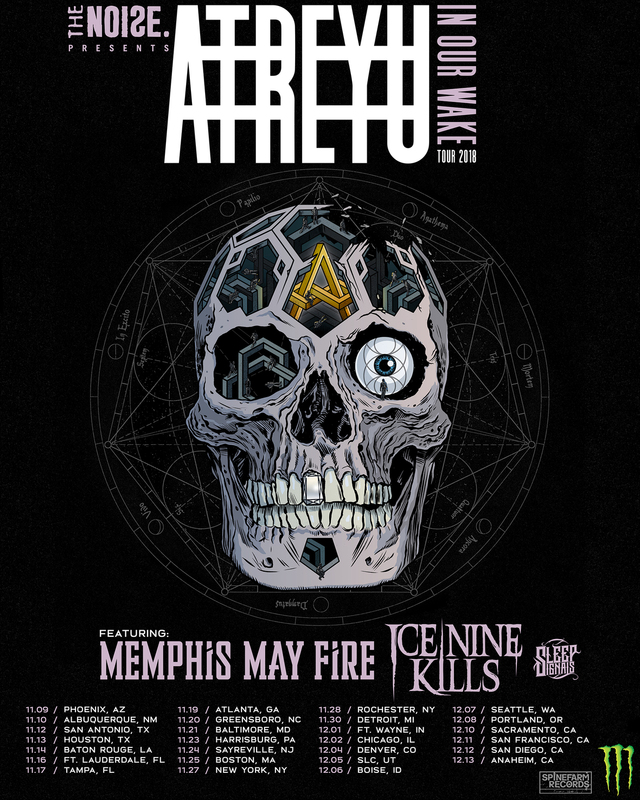 The schedule for Atreyu’s “In Our Wake” tour is noted below. The tour is sponsored by Monster Energy and Spinefarm Records. Tickets for Sleep Signals’ dates are available here. 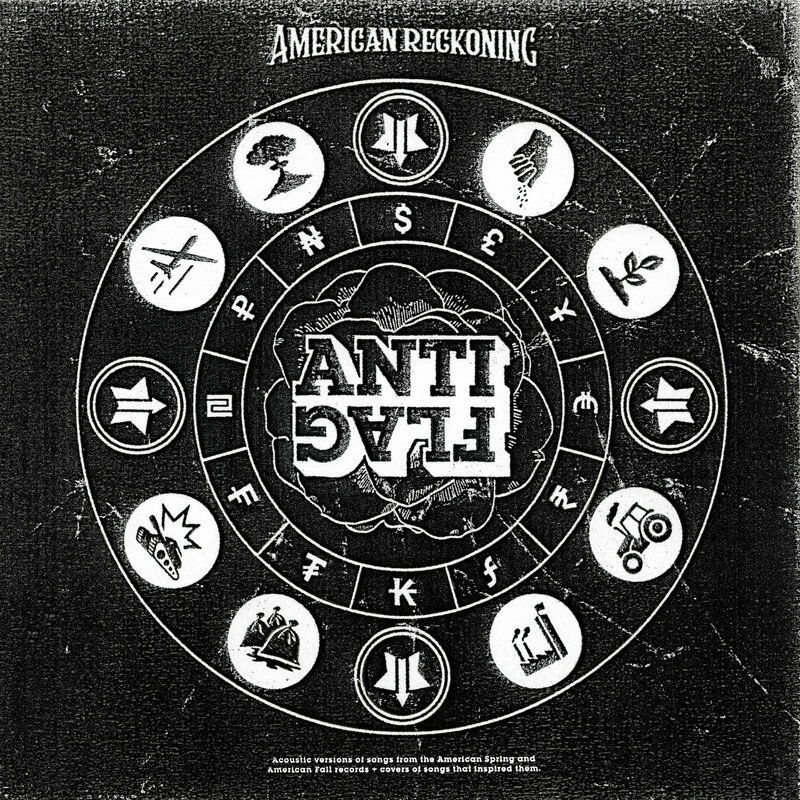 Anti-Flag’s cover of ‘For What It’s Worth’ is included in the band’s forthcoming album American Reckoning, which is currently scheduled to be released Sept. 28 via Spinefarm Records. The record, which was mixed and mastered by Justin Francis, features acoustic re-workings of songs from the band’s previous two albums American Spring (2015) and American Fall (2017) along with a handful of covers including this song. Pre-orders are open now. The record’s full track listing is noted below. The band explained in a written statement that while this is the first time that the band has covered ‘For What It’s Worth’ in whole, it’s not the first time that it has used elements of the song in its music. Additionally, the band praised Democracy Now! for its part in premiering the its new video. Anti-flag is touring now with Rise Against and AFI. 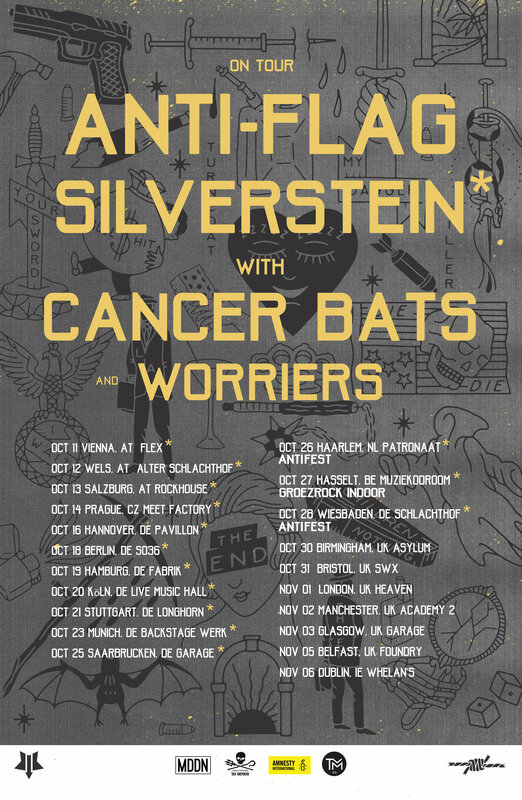 The band will launch a UK/European tour this fall with Silverstein, Cancer Bats and Worriers. 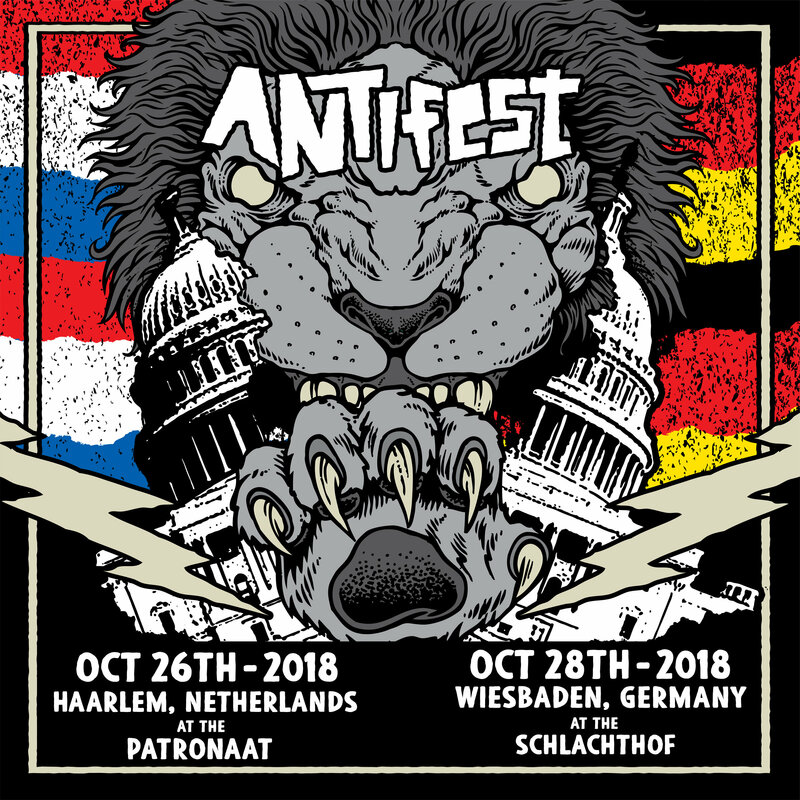 The tour will include two ANTIfest indoor shows, The band’s current tour schedule is noted below. Early last month, rock outfit The Temperance Movement released its third full-length studio recording to the masses to American Audiences via Snakefarm/Spinefarm Records. The band’s third album overall, it was originally released overseas Feb. 16 via Earache/Concord Music Group. The 12-song collection presents a slight change of pace from the band in comparison to the band’s previous albums, but even with that in mind, will still impress American audiences. That is in fact due in part to that change of pace in the record’s overall musical approach. It will be addressed shortly. In direct connection, the album’s sequencing plays its own important part to the whole of the album. It will be discussed a little bit later. The album’s production rounds out its most important elements. Each item is important in its own way, as will be pointed out here. All things considered, the album in whole proves to be its own “deep” presentation that audiences will thoroughly enjoy. 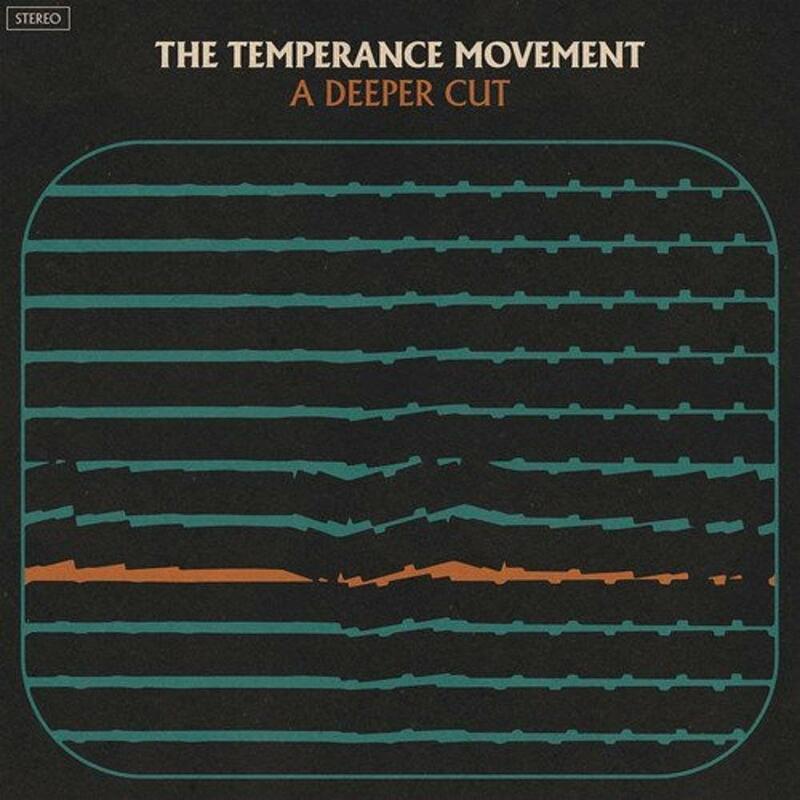 The Temperance Movement’s latest full-length studio recording A Deeper Cut is its own “deep” musical offering that audiences are certain to enjoy just as much as the band’s first two albums. That is due in part to the fact that the band has taken a slightly different approach to this album than its predecessors. While the band’s familiar, pure rock and roll sound is just as evident as ever throughout the album, there are also some more noticeably toned down entries added to the mix, too. The album’s title track, which comes early in the album’s run is just one of those more mellow entries included here. Musically speaking, it boasts (at least to this critic) hints of the Eagles and Simon & Garfunkel. In regards to its lyrical content, it offers just as much interest as front man Phil Campbell sings, “A deeper cut to draw my blood/So you can feel the wonder stuff/Who’ve I been kidding/Who am I kidding/That’s enough/’Cause we’re supposed to be beautiful/And all this time it’s been ludicrous/There’s always something in the way/A deeper cut than what you got/Before you know the ins and outs/A sweeter death than all the rest/That’s not how it works.” This comes across as a pretty deep topic. No pun was intended this time. It comes across as someone addressing another person who is on that edge. It could be a completely incorrect interpretation, and if so, then so be it. Either way, the melancholy nature of the song’s musical arrangement and even the lyrical content is a direction that the band has rarely delved into previously. It’s not the only song included in the record that takes that more subdued route. The southern rock/country vibe of ‘Another Spiral,’ the record’s midpoint, is another of the record’s more subdued moments. Whereas the album’s title track was a rather brooding type of work, this song, lyrically, is more positive. This is inferred as Campbell sings over the record’s Jamey Johnson/Zac Brown Band style arrangement, “Gentle is the love I breathe for you/Tiny whispers on your eyes/Now I’m hoping and I’m open to anything/And when you fall into another spiral going under/Hold on.” He goes on to sing over the song’s subdued musical arrangement, “Precious is the kiss of innocence/In the shadows of your mind/When you’re haunted, and unwanted images terrify/And when you fall into another spiral going under/Hold on.” This comes across as someone telling another not to give up no matter how bad things might get. The gentle approach shows again that more mellow approach that the band decided to try more so in this record. It’s more proof of why that approach helps the album, too and most certainly not the last. ‘Beast Nation,’ which immediately follows ‘Another Spiral’ is another way in which the album’s more mellow approach shows itself. ‘Beast Nation’ is not the subtle, subdued work that ‘A Deeper Cut’ and ‘Another Spiral’ are, but it still is more reserved than much of what the band has done before. The best description that can be given to the song’s musical arrangement is that its like crossing the best elements of the Eagles with Aerosmith. It sounds like quite the interesting combination, but it works, and its subtle approach shows once again the band’s directed attempt to give audiences something different this time around. The song’s lyrical content works well with that musical approach as Campbell seems to sing about a war veteran. This is inferred as he sings in the chorus, “When all you got left is a medal and a worn memory/Then the clarity comes and sediment settles/And you fly, fly away/And your wings are strong for all the right and wrong, you live to fight another day/Come inside and dry your eyes.” Veterans are known to have strong memories, so reading through this, one can’t help but think this must be addressing a veteran fighting with those memories. He sings of the figure having “no peace, no love, no money, no chief belief, no feeling, no wonder, no room, no space to breathe in and out, no end, no new beginning, no wonder.” One can imagine these thoughts going through a soldier’s head as he fights in a war, being overcome with just one thought – survival. That theme continues in the same fashion in the song’s second verse. It all comes together with the song’s moving chorus to make ‘Beast Nation’ a powerful work in its own subtle way. That is even though the song might not be as subtle and mellow as the other noted songs. It certainly is not the last of the album’s more mellow entries, either. ‘The Way It Was and The Way It Is Now’ and ‘Higher Than The Sun’ present that change of approach in this record, along with ‘Children,’ ‘There’s Still Time’ and ‘The Wonders We’ve Seen.’ Simply put, there’s a very noticeable change of tone from The Temperance Movement this time out, and it is a change that shows the band can still entertain even with a more reserved musical and lyrical approach overall. Keeping this in mind, the record’s more reserved approach is just one of the elements that makes the album stand out. Its sequencing plays into its presentation, too. While this record is largely rounded out by noticeable reserved musical compositions and lyrical themes, those arrangements and themes are not all that listeners get here. The album opens with a rollicking number with ‘Caught in the Middle’ that will instantly have listeners on their feet. The energy exuded in that song carries on into ‘Built-In Forgetter,’ the record’s second song and then straight into ‘Love and Devotion.’ This trio of songs instantly conjures thoughts of Royal Blood and similar acts before the album starts to pull back. Even as the band pulls back throughout the rest of the record, the album’s musical and lyrical energies never pull back too much at any one point. Case in point is the Allman Brothers Band style ‘Backwater Zoo’ that breaks up the much more reserved nature of the record’s title track and ‘Another Spiral.’ ‘The Way It Was and The Way It Is Now’ is another of those moments that while mellow in its own right, changes the album’s overall vibe again. The result is more insurance that listeners will remain engaged in the record. ‘Higher Than The Sun’ also helps to keep things from getting too reserved for too long, even though it is also more mellow than the high energy songs that open the album. As the album moves through its final trio of songs, its overall energy pulls back quite noticeably again. The thing is that the subtlety in the songs’ musical arrangements and lyrics still makes for its own power to the end that once again listeners’ engagement will remain certain. When this balance of energies is considered overall with the overall more mellow approach to this record, listeners will understand even more why this record proves so interesting. It still is not the last of the record’s most important elements. The record’s production rounds out its most important elements. The production of this record stands out because of its impact to the record’s sound. Considering the overall change in the album’s approach, even more attention than perhaps normal was needed to each song so as to make each work more emotionally impacting. That attention to detail is exhibited in each song, too with not one part overpowering the others. This applies both in the album’s high energy works and its more mellow and even emotional moments. Because of that attention to detail throughout the album, the overall result is an album whose musical arrangements ensure listeners’ engagement and entertainment. Just as important to note is that the balance also means it is that much easier to understand what Campbell sings in each song. On the surface that might not mean much, but in trying to interpret songs sans a lyrics sheet, it becomes very important. Keeping that in mind, the record’s overall production took everything possible into consideration with the end result being a record that gives every member of the band his own credit. The result of that is more appreciation for the album’s stylistic change and its sequencing. That leads ultimately to more appreciation overall for the album and the band. Atreyu will release its next album this fall, and in anticipation of its release, the veteran rock band has released not one, but two singles from the forthcoming record. The title track is streaming through various online outlets now and can be ordered online now here. Its video is streaming via YouTube. Front man Alex Varkatzas talked about In Our Wake‘s title track recently, saying that it was inspired by the loss of fellow rockers Chris Cornell and Chester Bennington. Bassist Porter McKnight explained the concept behind the ‘In Our Wake’ video. McKnight added that the video’s visual concept mirrors the overall theme of the album’s title. Drummer Brandon Saller agreed and expanded on McKnight’s thoughts. The release of In Our Wake will come a little more than a year after the release of its most recent album Long Live (2015). That album was also released via Spinefarm Records.